I’ve always thought of having a birth certificate in the U. S. as a legal right of U. S. citizenship. But I never stopped to think of it as a basic human right. Maybe that’s because we’ve always had birth certificates here. I frankly never thought much of it because I never had to experience what it’s like to have to prove who you are. Mr. Sonnah described birth certificates in Sierra Leone as being a basic human right – that your birth is documented and you as a person are legitimized. Simple and straightforward – but not easy in today’s rural Sierra Leone. Mr. Sonnah, teacher and volunteer organizer at Rotifunk’s Center for Community Empowerment and Transformation (CCET), said birth and death registration is required by law today in Sierra Leone, but the majority of rural communities either do not understand this or do not have the means to do it. Sixty percent of Sierra Leone’s population lives in rural areas with little to no national government presence. Traditional paramount chief rulers are the primary – and often the only – means of ensuring basic law and order, and delivering the fundamental systems of organized societies. Systems like registering births and deaths. So CCET is embarking on a project to organize a grass roots system to register births and deaths on a monthly level down to the smallest villages in Bumpeh Chiefdom. With 208 villages, many of them remote with barely drivable roads (in good weather) and little or no public transportation, this is no small task. The birth and death registration project is the brain child of Bumpeh Chiefdom Paramount Chief Charles Caulker. When Chief Caulker asked if Sherbro Foundation could help with sponsoring an initial training workshop, I asked him to explain why this project is important and how it fit within the foundation’s mission of furthering rural development. I could intuitively make the connection, but wanted his perspective. 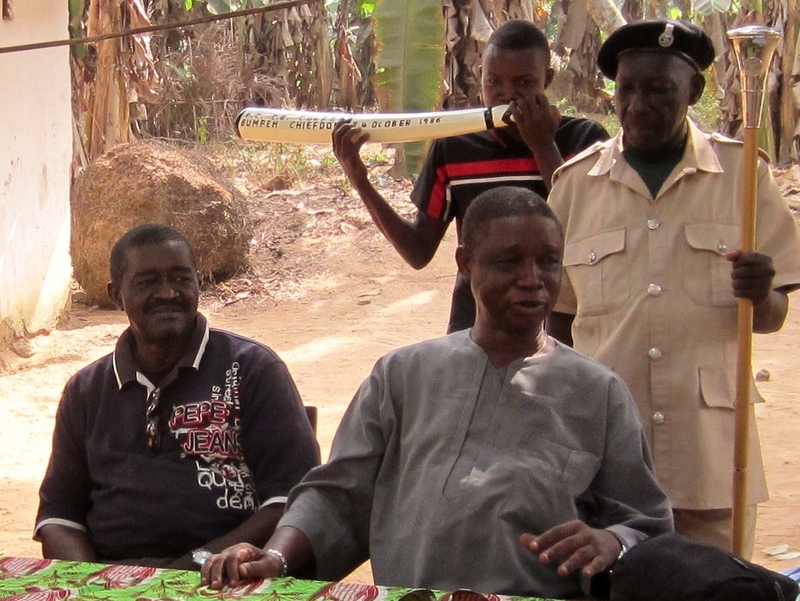 Paramount Chief Caulker in village meeting with his official staff bearer & horn blower. Arlene, he said, NGO’s (non-governmental organizations) and UN groups like UNICEF (United Nations Children’s Fund) come to Sierra Leone all the time to do studies and planning for their aid programs. We can’t accurately tell them about our population demographics, especially for children and children under the age of five – one their major program target groups. They then can’t do accurate forecasts and plan program budgets. They’re spending money to provide for children born in the past, and we can’t accurately tell them how many we have and where they are today. Sierra Leone is a country where 60% of its population is under the age of 24 years of age. The Infant Mortality Rate is still is 74.95 of 1000 live births – 11th highest of 224 countries worldwide. (From CIA World Factbook, Sierra Leone – last updated 2013) So, accurately counting children and planning program services for children is indeed an important part of rural development. There are more immediate and practical reasons why the people of Bumpeh Chiefdom need a birth registration system. Without a birth certificate, you cannot gain admission to schools and get the free health services the government provides. You must prove you are a Sierra Leone citizen. Nor can you cannot get a passport or contest election and run for local office. I asked Mr. Sonnah what people do today without birth certificates. They are penalized for not having one when they need it, he said, by paying a fine of Le 5000 (about $1.25USD). Then they are given one. Proving your birth and place of birth is more fundamental to us, Mr. Sonnah said. Beyond proving you are a Sierra Leone citizen, people want to claim their home village. They want to claim the cultural set (tribal group or ethnicity) they belong to. These are social rights that are important to us. When we consistently give people their rights to citizenship, Mr. Sonnah said, then we can ask them to perform the responsibilities of citizens. Things like paying taxes and voting, both institutions still in the early formative stages in Sierra Leone. Chief Caulker was frustrated with the lack of accurate population data and people in his own chiefdom missing their personal documentation. So he’s decided to organize a model program to register births and deaths in his own chiefdom. Bumpeh Chiefdom is divided into thirteen sections, each with a Section Chief and local leaders. Like the paramount chief, section chiefs are elected from traditional ruling families. They rule for life and are responsible for the welfare of the villages in their section. They periodically meet with Chief Caulker and other chiefdom leaders in a Chiefdom Council to discuss issues that affect them and their people. 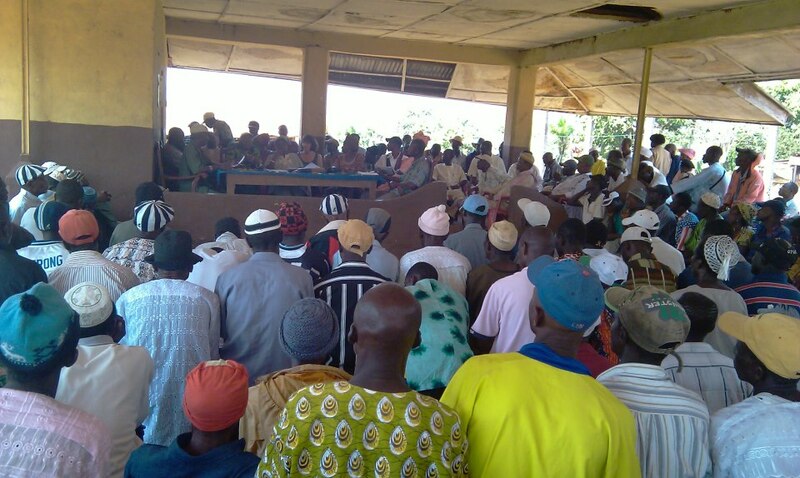 Bumpeh Chiefdom Council meeting – town hall style. This cascading system of traditional leaders will be used for the birth and death registration system. Villages will have a representative trained to keep a ledger recording births and deaths as they occur and bring them to their Section Chief. Monthly, sections will report their data to the chiefdom level to compile overall stats. It’s a simple manual system for now. But it’s the strong organization of traditional chiefdom leaders used to working together in a collaborative process that will make it work. That and the inclusiveness and steady hand Chief Caulker brings to managing chiefdom programs. An old tradition will also be reinstated with the birth registration system. The Center for Community Empowerment and Transformation will ensure each child born has a tree planted in their home village to recognize their birth. Read more about CCET’s Economic Tree Nursery project and how this will be used to provide birth trees here. The Sherbro Foundation is pleased to be sponsoring costs for an initial workshop where village representatives will be trained on registering births and deaths.